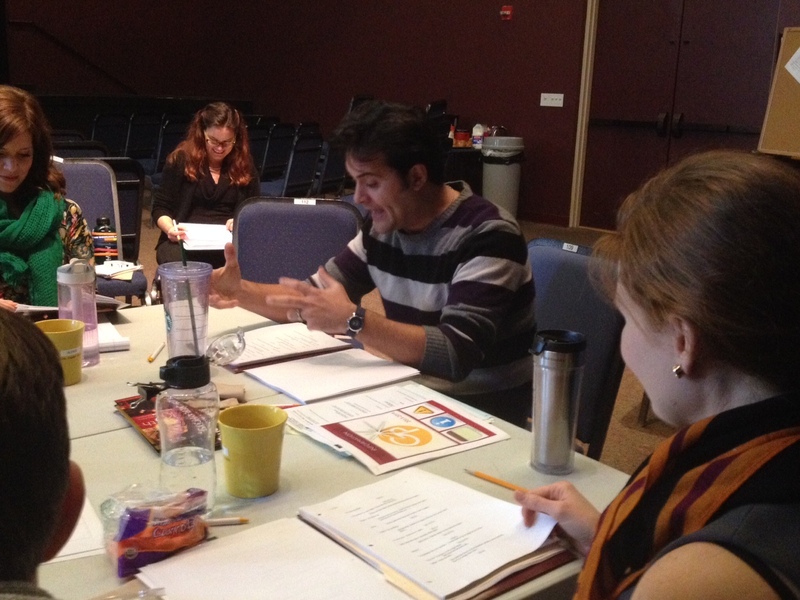 We started rehearsals this week for Ken Ludwig’s The Game’s Afoot. I tell you what, it is great to be back in a rehearsal room. Cody Nickell during the first read of THE GAME’S AFOOT. I had a really interesting realization this week as I was flouncing about the stage, trying to be funny, carrying dead bodies around (it’s a mystery comedy after all): I hadn’t been in a rehearsal as an actor with other actors in almost 8 months. Of course, I’ve been very busy making theatre in those eight months. Directing Something Intangible, acting in Jacob Marley’s Christmas Carol (but that was just me, talking for two-plus hours), writing grants and reading a boatload of plays. But, as far as I can figure out, eight months is the longest I have ever gone without acting across from other people, pretending to be someone I’m not, creating a community with the cast and crew, and working as a group to accomplish a shared goal. This job here at The Playhouse has afforded me some of the greatest opportunities of my career. I can’t begin to tell you how thankful I am for those chances to grow and expand beyond the stuff I usually do in this business. But acting is where I started. It is where I feel most comfortable (most of the time), and it is where I am right now. I have to say, I was surprised at how thankful I was to have a script in my hand, an acting partner to look at, a director telling me where to walk and stand, and a bunch of jokes to land. I love rehearsing. So many questions come up, and most of the time we find answers. Problem solving, puzzles, collaboration, these are buzzwords for me. I love tackling these shows, and I really love tackling them as an actor. And today, we have a straight six (for those of you not in the know, that means we rehearse for six straight hours with a 20 minute lunch break instead of 8 hours with an hour lunch)…so basically, I just wrote this on that break. This might not be one of the more in-depth blogs I’ve ever cranked out. But it is one that I am glad that I took the moment to reflect on. I am so thankful for all that I get to do here at Gulfshore Playhouse. I can’t think of a cooler path to have taken over the last 18 months. But I gotta say, I really, REALLY love being an actor. On with the show!